Every organization is unique in its own aspect and so is the recruitment process. Since this process may consist of multiple stages, it can be a strenuous task to keep track of candidates as they progress through each of these stages. Jobsoid allows you to configure your very own "Recruitment Pipeline" or "Workflow" to simplify your hiring as applications start pouring in for your job openings. By default, a candidate who applies for a job opening is allotted the New Stage in the recruitment pipeline. You can then move your candidates across the various stages of your pipeline as they progress. Moving a candidate in the recruitment pipeline can be done in three ways. Go to the Candidate profile. The current stage of the Candidate in the recruitment pipeline will be shown in the Pipeline widget on the Action Bar. You can change the current stage by simply clicking on one of the stages of recruitment on the pipeline widget. 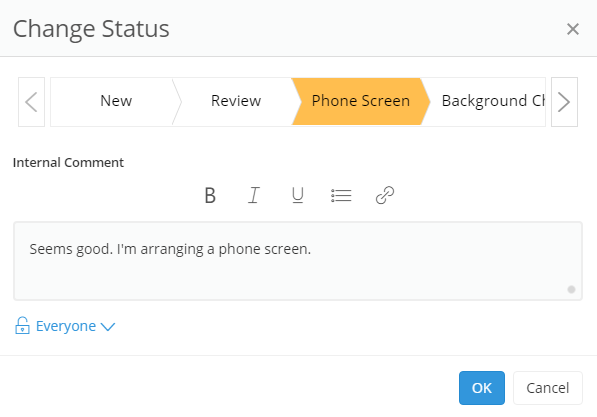 The two action buttons on the right-hand side of the action bar will also enable you to quickly move your Candidate to the next Positive or Negative outcome in your recruitment pipeline. You can also change the stage of the candidate by clicking on the drop-down on the pipeline widget. Click on the drop-down on the pipeline widget. This will open a Change Status window. Select the stage to which you want the candidate to be moved by scrolling through various stages of recruitment pipeline. You can add an internal comment to this status change. You can format your comment and also set access permissions for your comment. Note that a 'Reason' field will appear below the comment section in the Change Status window when changing the status of a candidate to 'Rejected' or 'Withdrawn'. Select the appropriate reason from the drop-down. The status of the candidate in the recruitment pipeline is also shown beside the Candidate Name on the Candidate list page.